By 2050, the Puget Sound region is expected to add 1.8 million residents – a 42 percent increase from our population today. That’s more than a little alarming when you consider that we don’t have enough housing for the people here now. The Puget Sound Regional Council (PSRC), composed of elected leaders from Pierce, King, Snohomish, and Kitsap Counties, guides the process for growth and transportation development, including how and where to put new housing. The PSRC’s VISION 2040 plan is the roadmap for regional planning. As the PSRC updates this plan to VISION 2050, we must ensure that the failure to foresee our current severe housing shortage is not repeated. One of the reasons that VISION 2040 has failed to adequately plan for housing is that PSRC doesn’t update their growth forecasts often enough. When job growth causes population to increase suddenly – as we’ve seen with smaller cities around Seattle that are absorbing far more people than predicted – PSRC doesn’t account for the changes, and the plan doesn’t pivot to accommodate the growth that actually occurs. Using VISION 2040 as a baseline in developing VISION 2050 will not be good for our tight housing market, because the new plan will have the same shortcomings that cause it to ignore the realities of our region’s growth. See our recent op-ed on this topic in Lens. We live in a dynamic, rapidly growing market, where growth doesn’t always occur as we expect it will. For more information, read our comments urging PSRC to base its approach on current evidence. 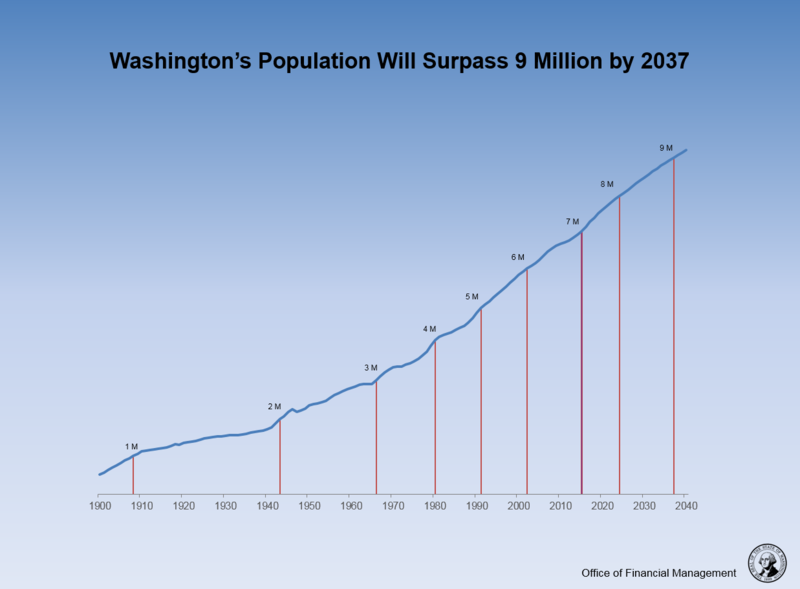 Washington state’s population, forecasted by the Office of Financial Management. for their November 2017 report. View the full report and presentation at www.ofm.wa.gov/washington-data-research/population-demographics/population-forecasts-and-projections/state-population-forecast.